As creative people, we all know that feeling of searching for inspiration — scouring the internet, in real life sources and individuals in our lives for the raw ingredients to make that “A-HA!” moment happen. Often, we refresh inspiration through external sources. The recipe is different for everyone — maybe it’s meeting a person you admire or travelling somewhere new or devouring a particularly good book. 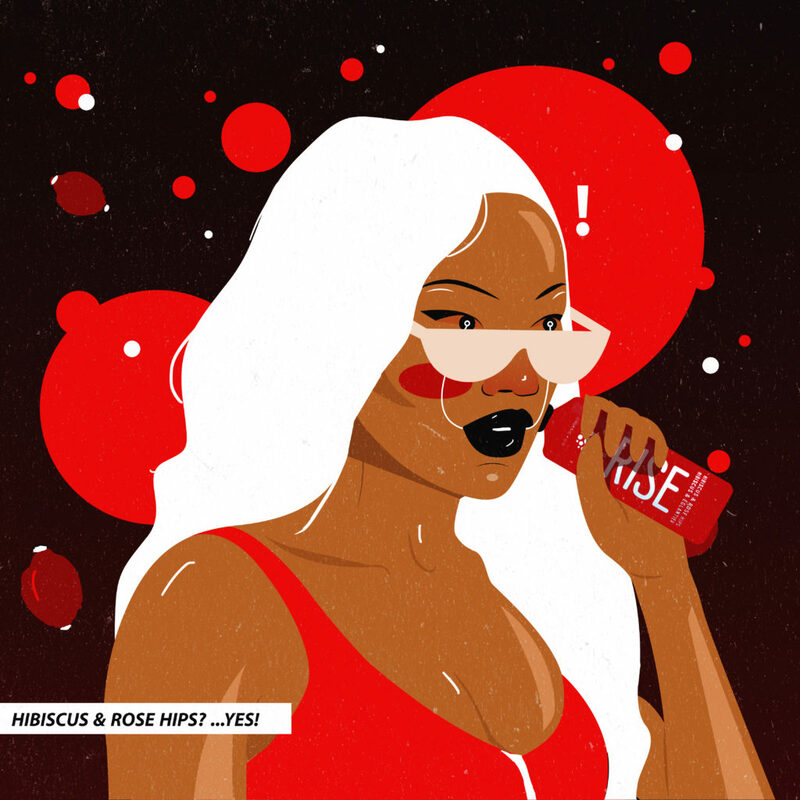 Toronto-based illustrator Alexis Eke draws her inspiration from renaissance portraiture and traditional Japanese art, washed down with her favourite bottle of RISE Hibiscus & Rose Hips kombucha. As a conscious creative, Eke has discovered that inspiration can bubble from within, fuelled by self-care like praying and reading that indulges her soul. Sure, she’s worked with huge clients like Nike Jordan, Canadian Broadcasting Corporation (CBC) and Sid Lee, but she knows it’s her little wellbeing rituals that recharge her — and one of them is popping a bottle of RISE kombucha. Why? Because when we feel our best, we create our best work. What was your initial inspiration for this illustration? Whenever I drink kombucha, I instantly feel bubbly and light inside. It makes me feel good and has great flavours. My inspiration for this piece was to illustrate excitement and the way RISE kombucha makes me feel. I started by writing down notes on how kombucha makes me feel. I knew I wanted this to be a playful illustration so I decided to go with a comic style. From there I start sketching and completed the illustration in Adobe Illustrator. I added the extra circles —to give it a “bubbly” feel— and the text in Photoshop. Praying and listening to all kinds of music helps keep my creativity flowing! RISE has inspired me to drink kombucha more often and to live a healthier lifestyle. With all the amazing flavour combinations, it makes the transition to healthy living a lot more enjoyable.